The Festival included a band, The Nu Tones, Friday and Saturday nights, dancing, several games of chance, Polish baked goods, and some trinkets and other St. Stan's and other religious items for sale. And food. Lots of it, and it was all delicious. They had beef rolls, chicken, pork, sauerkraut and kielbasa, cabbage and noodles, cabbage rolls, cucumber salad, potato pancakes, and cheese, sauerkraut, or potato pierogies. The Festival was very crowded. It was not a great environment for my two year old son because there was not a lot for him to do there and he was not patient enough for the long lines. Despite his impatience, it was worth attending. 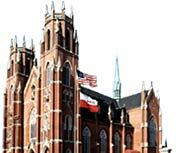 If you like good Polish food and would like to support an organization that is working to keep the neighborhood and its traditions alive, then consider attending the St. Stanislaus Polish Festival this year and in the years to come. While we were at the Festival, we had an opportunity to meet Congressman Dennis Kucinich. He was there with his beautiful wife meeting and greeting people, shaking hands and saying hello. He was kind enough to pose for a picture with my son and me Ken. 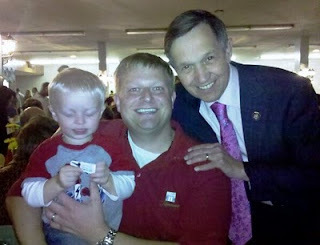 For the last several years, but especially after 2008, I have been a fan of Mr. Kucinich. At first I liked him only because I respected how he did his job as a congressman. He always stood up and spoke up for his beliefs and brought a lot of needed attention to them. During the Presidential election of 2008 I started to pay much closer attention to his politics, and discovered his positions were very close to my own. Since then he has had my support, and probably always will. About six months ago I wrote a post that included a link to an inventory of political positions that would take the answers provided and place the person taking the inventory on a political spectrum. In addition to left and right, this spectrum included a vertical axis to more accurately place political ideologies. The web site also showed where today's leaders and candidates placed on the graph. Not surprisingly, I was very near Mr. Kucinich. I think we can all count on Mr. Kucinich to really stick up for the middle/working class. Many politicians say as much, but then cast their votes in favor of business or corporate interests, and leave the rest of us to fend for ourselves. This is evidenced by his desire for single-payer healthcare and an end to the wars in Iraq and Afghanistan, among other things. Meeting Mr. Kucinich today was an unexpected and very pleasant surprise. In a way it changed my experience at the Polish Festival on a personal level. 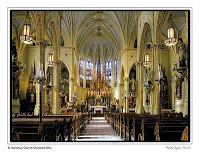 I went to see St. Stanislaus, my grandfather's childhood church and school, to learn or experience a little of the history of my family. I thought it was very likely that members of the Tylicki family were there, even if I didn't know them or even recognize them. While there, I met Mr. Kucinich, whose hard work for the people of Cleveland and the United States will make the world a better place for my son to grow up in. For many, the Polish Festival was just an opportunity to have a good meal, attend a fundraiser for a cause that is important to them, and socialize with family and friends. For me, it was a moment when appreciation for the past and optimism for the future met. Great picture, Im jealous. As you might expect I'm a fan of his as well.